Button collector Josie Giancola has a sharp eye for detail, and a love for keeping things together. 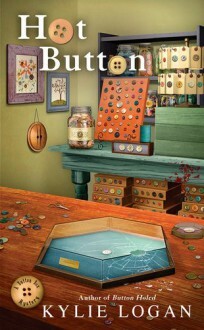 But when a murder interrupts her button business, she’s always ready to snap into action… As chairwoman of an international conference for button collectors, Josie has plenty to worry about. Between greeting collectors, overseeing the dinner cruise, and attending to the many needs of the guest of honor, Thad Wyant, she barely has time to deal with her gorgeous ex-husband…let alone a dead body.But when Thad is found dead in a hotel linen closet, Detective Nevin Riley needs Josie to help him solve the case. Mr. Wyant’s historic Geronimo button has gone missing, and considering how many enemies he’s made in the small and peculiar world of button collectors, Josie will have to act fast—before she becomes history herself...Includes tips on antique button collecting! I really liked this one! And I was right about who the "bad guy" was, in more ways than one! Kylie Logan also writes the Pepper Martin series as Casey Daniels, and that series is a favorite of mine. Looks like this one will be, too! RECOMMEND!